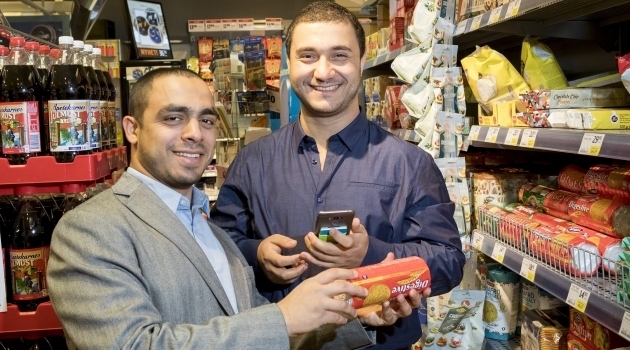 Mohamad Alsioufi and Abdul Rahman Khankan have created Ingrid, a personal grocery assistant to help people with special dietary requirements. Mohamad Alsioufi and Abdul Rahman Khankan are former students from Uppsala University who both have a Master’s degree in Computer Science. In addition to graduating in 2017, they participated in the entrepreneur competition Företagsänglarna to put their business idea to the test and compete for funding. – Many people have specific dietary requirements for different reasons, such as lifestyles, like vegan or vegetarian; Religious reasons, like eating Halal or Kosher; or for health-related needs, like allergies and intolerances. Today they can’t enjoy a shopping experience as much as others because they must check the ingredients of every product they would like to buy, and in most cases those ingredients are written in very fine letters, and possibly in a language that they don’t know. Moreover, even if they can read the ingredients, they are not able to identify each food ingredient, like for example what does E120 mean? Is it suitable for my dietary requirement? To meet those needs, we created Ingrid. A multilingual, personal grocery assistant to help people with special dietary requirements. A mobile application where the user selects their language, their dietary profile, and then scan the barcode of the product, and then ‘Ingrid’ shows a list of ingredients and point out any ingredients that do not suit the preselected dietary profile if any. How did you come up with the name Ingrid? – We chose the name Ingrid after a lot of thinking. We wanted our product to have character, a name that implicitly implies a person, which gives the users the feeling of assistance, and reflects the idea of the app, and something related to Sweden. Then we came up with the golden name that solves this formula! Ingrid, a character name, Swedish, and ‘ingredients’! What was it like to participate in Företagsänglarna? “Företagsänglarna was a great chance for us to meet business people and potential users of Ingrid. We were hesitant at the beginning, but then we decided to take that step and participate, and put Ingrid in the spotlight. Thankfully, we were chosen among tens of brilliant ideas in the semifinal; and then we made it to the finals, which we think is a great verification for our idea! We learnt a lot from this show. To begin with, we now know how to present our idea in a very short time. In the first round, we had 45 seconds to pitch our idea, which was very challenging, but we did it! We also learned how to present the idea in front of investors. You must be very clear and confident about every single word you say, and on top of this we learnt how to write a business plan, it was our first time to think about Ingrid in that level of details. In general, it was a great experience and we really encourage everyone who has an idea to try it in this show! When will you be launching the app? – Right now, we have a big database for almost all the products in Sweden, we are working on classifying these products according to different dietary profiles and we hope that Ingrid will be in the different app stores in some months. Do you have some tips for those who have a business idea that they want to develop? – First of all, start working on it as soon as possible! Do not postpone it! Ask for help, there are many places where you can get help, like UU Innovation, UIC, Drivhuset, and many more. Be proud of it and be brave to pitch it everywhere, the more you talk about it, the more feedback you get, and finally participate in some competitions like startup weekends or Företagsänglarna as it will give you the chance to build a team and to get feedback from experts. Företagsänglarna is an online tv show and an entrepreneur competition where students, inventors and other creative people with an Uppsala connection get the chance to realise their business ideas. Registration is open and casting takes place 21–22 April. Uppsala University Innovation (UU Innovation) is one of several partners to Företagsänglarna. For more information and registration go to Företagsänglarnas website.